In the above two cases, there is always some energy loss during the power generating system operation. To obtain both wind and solar energy at the same time, a microproces­sor and two batteries as shown in Fig. 5 are employed to control the charging operation from both energy sources. Figure 11 displays the circuit in detail, in which controller IC1 and comparator IC2 control the system operation. Depending on the weather condition, wind energy can charge the wind battery Ebw directly or the solar battery Ebp indirectly through Qws. Both wind and solar energy are sensed by two comparators of IC2. One senses the sunlight to control the load while the other monitors the charging condition of the wind battery. If there has been no wind or sun for some days and both wind and solar ener­gies remain insufficient, the two batteries will be in under-charged condition and utility power supply will be used instead. In view of large variations in wind energy, a current transformer CT is employed to detect the charging current of the wind battery. 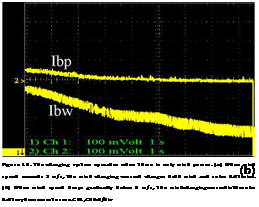 If the charging current exceeds the specification of the battery, Qw runs in PWM mode to protect the battery. 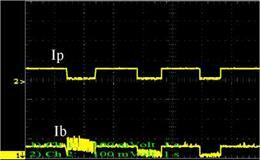 All functions are controlled by the software of controller IC1. As shown in Fig. 12, when wind speed is low, about 3 m/s, the system runs in the independent charging mode and the solar battery charging current remains constant at 2A, although there are slight variations in the charging current of the wind battery. If there is only wind power, as shown in Fig. 14(a), the system runs in the wind – hybrid charging mode, so the unstable wind charging current charges both wind and solar batteries. 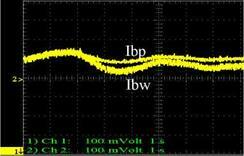 When the charging current is less than 2 A, as shown in Fig. 14(b), the system remains in the wind – hybrid charging mode and only the wind battery is being charged. Whenthere is solar energy and a high wind speed at thesametime, asshown inFig. 15, the system rnnsin the wind-enhnnaed chatginn mode. In orclee ta benefet framhoth єпєгпуоопрі es and reduce Allegations from the winS source, tins spsCem runu inthe wind-enhenned ahargmg mode whtn gewindeharging current is above 3A. The wind charging current charges the solarbetiergin additien tn theoriginal wine battury, leadingtoeariaiions g the eolascharging otarm.. Wten sna wmdchaagme c-taenl: gs beknw eA, the s^tem mnsg thegrlependent ahargirtg mo^r Thai: r – na rln. lo seder rhnrgmncnsrenC of 2A and the fluctuating wind charging current charge the solar battery and the wind battery, respectively. Figure10. Switch-controlled wind and solar sources charge a battery. Ch1: battery charging current (A/div), Ch2: solar charging current (a),(b), wind charging current (c) (A/div). (a) Wind speed is 3 m/s, but it is unstable. The charging duty cycle ratio between solar and wind power is 2:1. 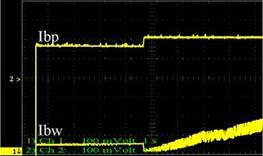 In the absence of wind power, only the solar charging current (0.6 A) charges the battery. In the presence of wind power, the wind charging current gradually decays. Because the wind charging duration is only 0.8 second, steady state cannot be attained. (b) Wind speed is increased to about 4 m/s and solar charging current is decreased to 0.4 A. Wind energy exceeds solar energy. (c) Wind speed is increased to 5 m/s. The charging duty cycle ratio between solar and wind power is changed to 1:2. Moreover, the solar charging duration is extended from 1.8 to 3.2 seconds. In this situation, mechanical energy accumulated by inertia of the wind turbine during solar charging can also be utilized during wind charging. Hence, this configuration can ensure full uti – lizationofwindenergywithnoloss atall. Figure 11. 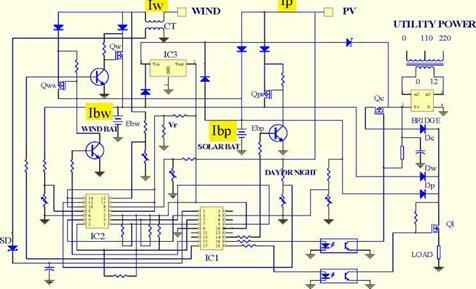 Microprocessor-controlled hybrid wind and solar charging circuit. 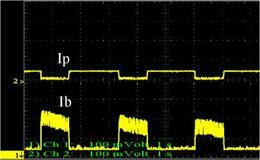 Microprocessor IC1 and Comparator IC2 controls the wind charging current Iw and the solar charging current Ip that fuel the wind (EbJ and solar (Ebp) battery. According to the weather condition, the wind and solar charging currents may charge either the windorsolar battery. Current transformer CT sensesthewindchargingcurrent to prevent damage tothe battery by excess charging cur­rent. If the energy of the battxrinr canaep nrnel: tge powersequired, utility power swp^y is usae instead. Figure 13. The charging system operates in two stages. In Stage 1, only solar energy exists. The solar charging current not onlycharges the solar battery but alsothe wind battery. In Stage2,when windpower aslso exists, the wind charg – ingcurrentchargesthewind battee. Pert oh hha soIdreharging cerreoh is switchnC daek tt tine solar batgerp Cdh, Ch2: A/div. In this study, theoretical investigations are performed to examine the effect of source impe­dance on a small hybrid wind and PV power system. 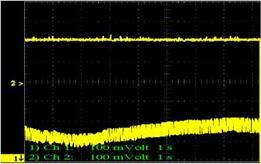 Because of voltage drop in power sources, both energy sources cannot charge a battery simultaneously after initial charging. This study proposed using a switch circuit to increase the utilization of both energy sources. There is only slight solar energy loss when wind power is in operation. To increase energy efficiency by gaining both wind and solar energy, a microprocessor-based hybrid charging system is proposed. Results show that besides increasing the reliability of the power system, the fluctuations in wind energy source are also reduced. Guha, S. S. (1986). 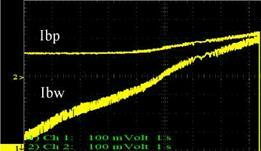 Enhancement of open circuit voltage in high efficiency amorphous silicon alloy solar cells. Appl Phys Lett, 49, 218.